We are joined by John Bass and Corey Todaro, who are respectively CEO and CPO of Hashed Health, an innovation firm focused on accelerating the meaningful development of blockchain and distributed ledger technologies for the industry. Hashed Health works to build solutions which leverage blockchain to solve some of the most important challenges facing this sector. The new “FINMA Roundtable on ICOs” PDF is available for download from the regulatory materials section of the Crypto Valley Association document repository. We just received word that Crypto Explorers is hosting a reception with Alex Tapscott this Monday, March 26, in Zug. All CVA members and friends are invited to come out and meet one of the premier thought leaders in the crypto space. The Crypto Summit will be held on 27-28th March at Samsung Hall in Zurich. 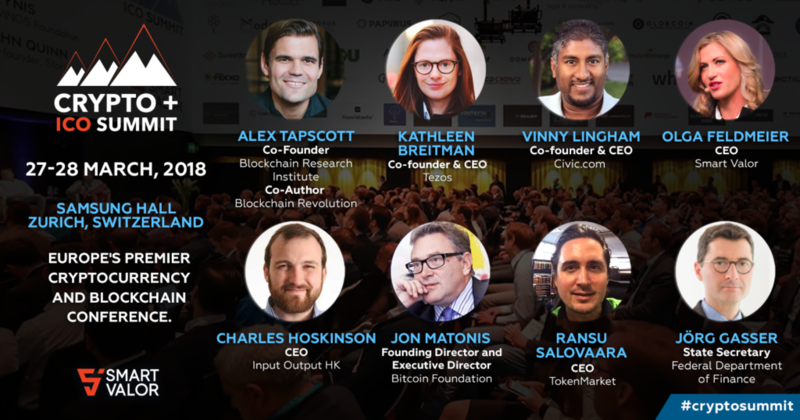 Overall, this event is set to bring together leading figures in the global crypto community including Vinny Lingham (CEO of Civic), Alex Tapscott (CEO NextBlock Global), Kathleen Breitman (CEO Tezos), Tim Draper (a venture investor), Jon Matonis (Founding Director of Bitcoin Foundation) and Ransu Salovaara (CEO of TokenMarket). This year the Crypto Summit will expand on the previous event’s colourful programme of workshops, keynotes and panel discussions. The conference will also include two new tracks: the Crypto Investment Track and the Tech Track. This year’s summit is set to bring together some of the biggest names in crypto to share their experience and best practices for successful crypto investments and ICO execution, including a keynote from blockchain expert Alex Tapscott. Last year this event became the first international blockchain conference in Switzerland, with 85% of speakers coming from outside of Switzerland and over 30 countries represented among attendees. The keynote was delivered by William Mougayar, one of the key thought leaders in the crypto financing field. This years edition devoted to the theme “Shaping crypto together” is currently open for speaker and sponsor registration. Tech start-ups may (partly) compensate their founders, developers or employees using cryptocurrency. There are various good reasons to do so. It’s an effective way for innovative tech industry employers to attract the most talented people, and it frees up fiat funds for investment in the growing business. How is the cryptocurrency payment qualified for legal and tax purposes? Where did the founders, developers or employees work and live at the time of payment? What is considered to be the date of realization for tax and social security purposes? Payment in cryptocurrency or conversion of cryptocurrency into fiat? What is the cryptocurrency intended to compensate? Will work need to be performed in the future or was the work performed in the past? In most cases, Swiss tax law requires affected start-ups to prepare a specific annex to the 2017 salary certificates – in some certain circumstances even if no signed employment agreement is in place. Due to the complexity of the topic and the current lack of clear rules or common practice, it is crucial to verify each case individually. In general, it is advisable to clarify the reporting obligations, tax and social security aspects of such grants and consequently assure correct withholdings by the employer or “employee”. Failure to do so may not only trigger subsequent tax and social security obligations, but also late payment interest, penalties and/or fines from the corresponding authorities – payable in fiat.